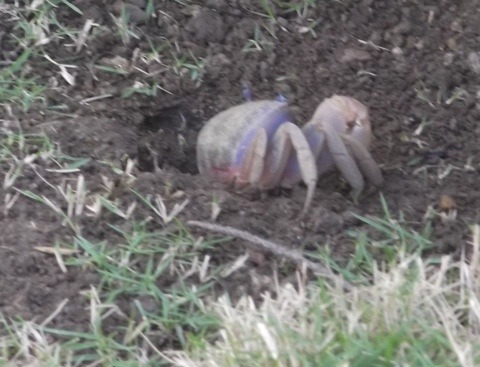 Walking down from my room in the Mango Creek Lodge hillside lodge I was thinking of my recent crab sighting at closely watching the crab holes in the ground that I passed. This time I noticed one crab hiding within his hole. I wasn’t about to scare it. I walked past it and then stayed very still just to see if I could see it come out. That’s when I noticed another crab right there beside the other crab’s hole. And… I got a photo of it. After I took the photo he raced into his own hole. I resumed my walk so they could relax.